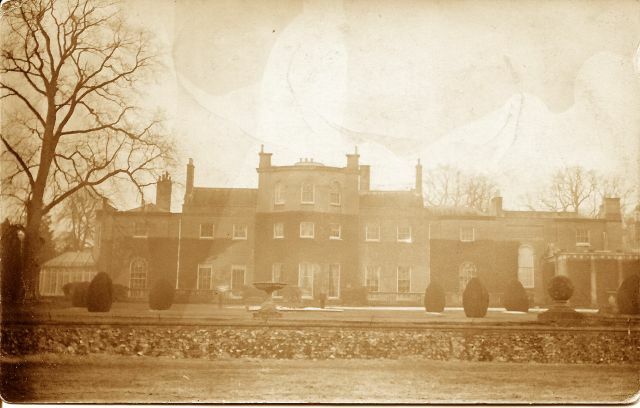 There are few surviving photographs of Downham Hall, which was demolished in the 1920s. It is therefore always a huge thrill when new ones come to light – something that has happened twice in recent years. Few people today remember the Hall, and so we were delighted when Marg Kenny Murby came to visit, together with her daughter and son-in-law Willo & Tom Heesom. 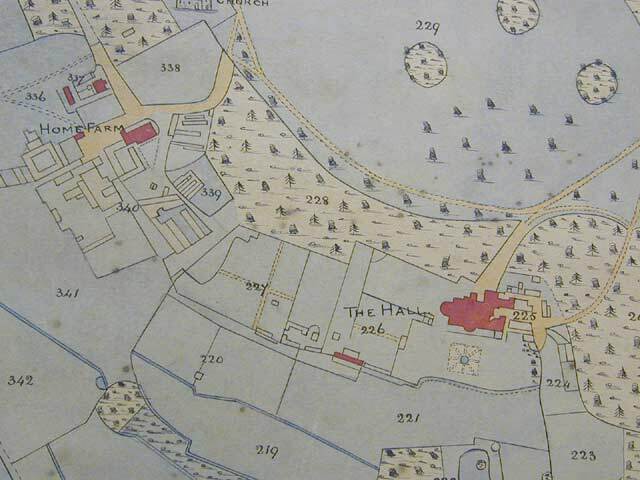 Mrs Kenny Murby has a very special link with Santon Downham. Her father, Colonel Albert Robert Kenny came from Canada to the Brandon area in the First World War – the youngest Colonel in the British Army’s Cavalry at the time. 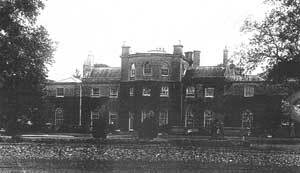 He was the commanding officer in charge of the Hall, which had been taken over by the Army, and was responsible for the lumberjacks and prisoners working here as part of the war effort. Mrs Kenny Murby came from Ottowa to the UK twice during the war years, travelling on troop ships with her intrepid mother. The first time, she was a babe-in-arms, and the second she was aged about four. 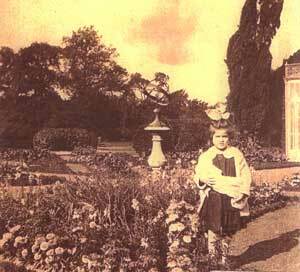 She had vivid recollections of the area although she was very young, and remembers wonderful high walled gardens with roses – now long gone. 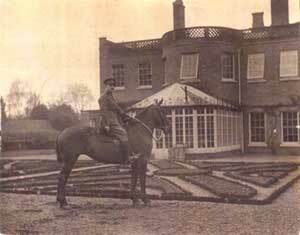 Her visit in 2003 was her first to Santon Downham since about 1918, so it had changed beyond all recognition! 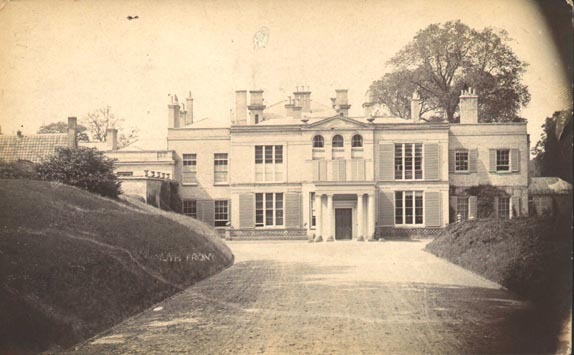 Three wonderful photos from her collection show Colonel Kenny at the east side of the Hall, four year old Marg Kenny Murby as a little girl in the impressive grounds, and a rare rear photograph of the Hall. The other excellent picture to come to light in recent years was a postcard, given to the 22 villages team by Ann & Bernard Rush. We do have a few other pictures scanned from books and so on – we will list the sources in due course – in the meantime, contact us if you would like details of them. 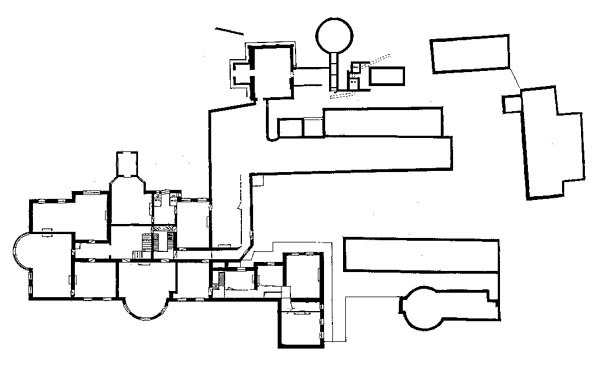 Ronnie Moran provided us with a large quantiy of material copied from various sources. We have an album of photos from 1893. 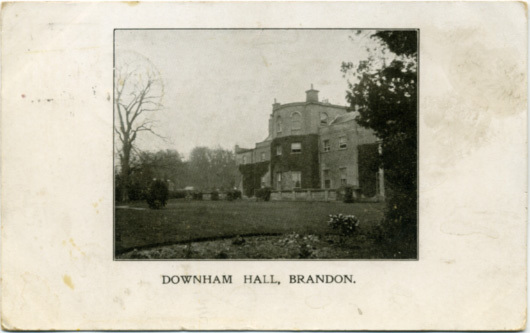 Please also contact us if you have any old pictures of Santon Downham or the Hall that you would be willing for us to include on this site.